After a warm up, There is a solid mix of 10 tracks at 132 bpm that focus on various body parts. In between each 5 minute track is a 1 minute transition/change up that lets the class know Your moving onto another area of focus. 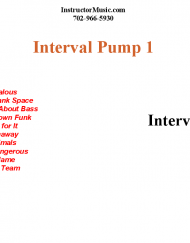 The new Interval workout mix is straight from the retro pool. It kicks off with All I Wanna Do by Sheryl Crow. Your classes will get a good (Jump Start) with Natalie Cole. As they continue threw this mix the Rhythm Is Gonna Get You. Other highlights include The Loco-Motion/Kylie Minogue, You Spin Me Around and Electric Avenue keep the energy level high. This mix is PG -Rated. 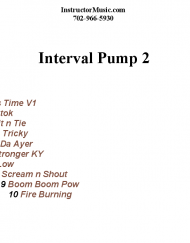 Our new Interval workout mix will deliver a motivating and energetic workout for your intervals class. After a warm up, There is a solid mix of 10 tracks at 132 bpm that focus on various body parts. In between each 5 minute track is a 1 minute transition/change up that lets the class know Your moving onto another area of focus. The mix contains all the current Top 40 radio hits as well as some recurrent favorites. Artists include “Issues”, “Move Your Body” and “Kissing Strangers”. This mix is PG-Rated. Our new Interval workout mix will deliver a motivating and energetic workout for your intervals class. After a warm up, There is a solid mix of 10 tracks at 132 bpm that focus on various body parts. In between each 5 minute track is a 1 minute transition/change up that lets the class know Your moving onto another area of focus. The mix contains all the current Top 40 radio hits as well as some recurrent favorites. Artists include “The Cure”, “Feel The Love” and “Kissing Strangers”. This mix is PG-Rated. 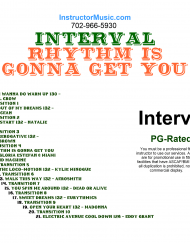 Our new Interval workout mix will deliver a motivating and energetic workout for your intervals class. After a warm up, There is a solid mix of 10 tracks at 132 bpm that focus on various body parts. In between each 5 minute track is a 1 minute transition/change up that lets the class know Your moving onto another area of focus. The mix contains all the current Top 40 radio hits as well as some recurrent favorites. Artists include “Stay”, “The Right Song” and “I Feel It Coming”. This mix is PG-Rated. 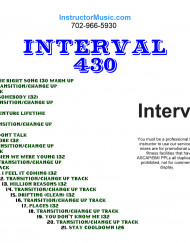 Dianna asked us to deliver a motivating and energetic workout mix for her intervals class. After a warm up, she needed a solid mix of 10 tracks at 132 bpm that focused on various body parts. In between each 5 minute track is a 1 minute transition/change up that lets the class know she’s moving onto another area of focus. The mix contains all the current Top 40 radio hits as well as some recurrent favorites. Artists include “Heathens”, “Into You” and a classic mash up “I Wanna Dance Vs. We Found Love”. This mix is PG-Rated.